The demand situation for Belgian machines and engineering businesses is generally positive, but still affected by difficulties in some major buyer industries (e.g. construction and transport). While competition is strong, high quality producers usually enjoy a competitive edge. Brexit and looming trade disputes are potential downside risks for export-oriented subsectors. In general, the profit margins of Belgian machinery/ engineering businesses have remained stable over the past 12 months as companies were able to reduce their cost base. In the coming months margins are expected to remain stable or to deteriorate slightly, depending on the level of activity and the future development of raw material and energy prices. Labour costs continue to weigh on profit margins. 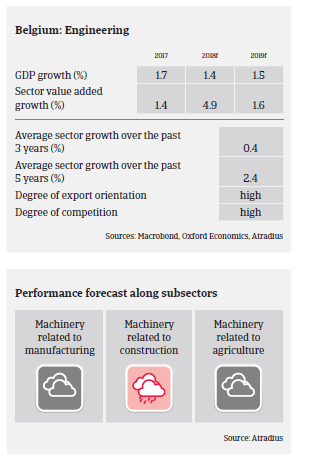 Gearing continues to be high in the machinery sector due to required investments. Businesses that do not have access to financing cannot perform in a sustainable and innovative way. In general, banks are neutral to moderately restrictive in granting loans. On average, payments in the Belgian machinery/engineering sector take around 60 days. Payment experience is average, and the level of protracted payments has been low over the past couple of years. The number of non-payment cases has slightly decreased over the past six months. The number of insolvencies in the industry is at a low to medium level compared to other Belgian sectors, and expected to remain stable in the coming months. Our underwriting stance on the sector is generally neutral for machinery businesses related to manufacturing, electronic machinery, and agriculture/food-related segments. However, we are restrictive in underwriting engineering businesses depending on construction, due the subdued performance and rising insolvencies in the Belgian building industry. Non-payment cases remain at an elevated level in the construction-related engineering segment. The energy sector-related machinery segment is currently troubled by a low level of order books. However, the solar, wind, and heating pumps machinery segments are in a positive trend.